How many people can be accommodated in a 2-bedroom Apartment? Our two bedroom apartments accommodate 4 guests utilising a queen bed and 2 x single beds. A 5th person can be accommodated on a rollaway bed for just $30.00 extra per night. How many people can be accommodated in a 1-bedroom Apartment? Our one bedroom apartments are perfect for a couple and have just one queen size bed. We do have a few one bedroom apartments that have a king size bed that can also be split into two single beds. An extra person can be accommodated on a rollaway bed for just $30.00 per night. What is the difference between a Standard and Ocean Apartment? All of our apartments face east towards the Ocean. Our apartments from the third floor and above (Ocean rooms) have a better view than our ground, first and second floor apartments (standard rooms) due to the view being slightly obstructed by trees in the park across the road. Our nightly rate is slightly cheaper for standard rooms because of this. Are the apartments all the same size? Yes, all our one bedroom apartments are the same size and all our two bedroom apartments are the same size. The building faces east with views of the ocean from all the balconies. Our ground floor rooms have a view of the garden and pool area. 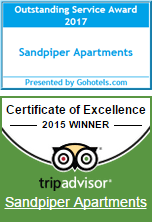 What are the facilities in the apartments at Sandpiper? All the apartments are fully self-contained, have full kitchen facilities, lounge / dining area, separate bedrooms and bathrooms as well as laundry facilities in each. Can you arrange champagne, flower or chocolates for a special occasion on arrival? Most of our 1 bedroom apartments have air-con. At this stage our 2 bedroom apartments are not air-conditioned. Yes – all year round the pool is heated to 29 - 30 degrees. Our spa is heated to around 37 degrees in the winter. What would the ocean temperature be at Broadbeach? Luckily we are able to swim all year round. You can find answers on BOM regarding year round temperatures. What is the check-in and checkout times? Normal check-in time is 2.00pm, however if you arrive early and the apartment is available we are happy for you to check-in early. If we have guests in the apartments the night before then we will have the apartment ready for you as quick as possible after they depart at 10.00am. We would be happy to look after your luggage until check-in is available. If we arrive at Sandpiper after-hours and your office is closed, how do we gain access? We do have an after-hours procedure which is very simple. Please feel free to contact us if you are arriving outside our office hours and we are happy to discuss the procedure over the phone or via email. We would love to catch-up with you the following morning after arrival for registration, so we can also provide you with another set of keys. How far is Sandpiper from Jupiter’s Casino? The Casino is adjacent to the Convention Centre therefore the walking distance and time is the same. How far is Sandpiper from the Gold Coast Convention Centre? We are just a 5-10 minute walk to the Convention Centre. How far is Pacific Fair Shopping Centre from Sandpiper? Pacific Fair is also close to the Casino and Convention centre, so only a 10-15 minute walk. If you don’t wish to walk, you can catch the new light rail system from the Broadbeach North station on the Gold Coast highway to the Broadbeach South station, which stops alongside the front of Pacific Fair. It is only a few minutes’ walk from there to inside the shopping centre. You won’t get much closer! We are right across the road from the Park and Beach. Just walk out the gate, across Old Burleigh Road and onto a gorgeous park with BBQ’s and space for the whole family to play and a patrolled beach (life guards on duty). Why is the location so good? We are only a 2 minute walk to the middle of Broadbeach but also just far enough away to not be effected by the hustle & bustle or the noise of the night clubs. We have fabulous restaurants, cafes, Oasis Shopping Centre, Park and Beach right on our doorstep…….we think it’s the best location in Broadbeach! How far is Sandpiper from Surfers Paradise? We are just a 10 minute drive or approximately 30-40 minute walk to Cavill Mall which is the centre of Surfers Paradise. Sea World is in Main Beach which is approximately 20 minutes travelling from Broadbeach. Movie World, Wet N Wild and Dreamworld are approximately 40 minutes travelling time. We are a member of TicketMates which enables us to bring you the best day tours, attractions, activities, theme park tickets, cruises, water sports, whale watching and things to do on the Gold Coast usually at better prices than buying direct. Are we able to book our Gold Coast day tours with Sandpiper? Yes, through our website you are able to peruse a great range of things to see and do on the Gold Coast. Click here to read more and to book. Mid-season is during June and September School Holidays and from mid- January through until after the Australia Day weekend. High Season is over the Christmas / New Year holiday through to mid- January, Easter, Blues on Broadbeach and October car racing weekend. There are several events on around Broadbeach each year so it always pays to call us direct or check our website. We guarantee the best rates for all direct bookings. What is the temperature in Broadbeach in summer? What are the best things to do on the Gold Coast during Summer, Winter? There is always something to do here. The Theme Parks operate all year round and are continually changing and up-grading their rides and attractions. The shopping is always amazing whether you are looking for a great bargain at the outlet shops or high end shops at Robina Town Centre and Pacific Fair. There are many wonderful restaurants and cafes to enjoy or spend you days lazing at the beach…….you can do as much or as little as you like depending on what type of holiday you want.